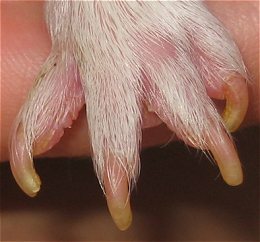 Trim nails regularly and examine your guinea pig's feet so you can catch problems like pododermatitis (bumblefoot) before they become serious. 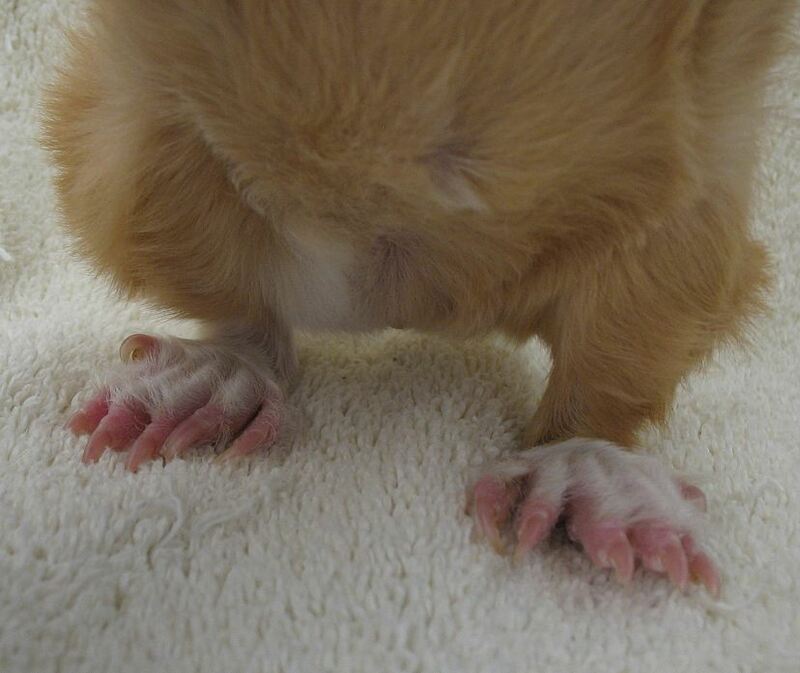 Most guinea pigs are born with four toes on their front feet and 3 toes on their hind feet. Each toe has a continuously growing nail consisting of the outer horny part and the inner living part called the "quick". The underside of the foot has a soft foot pad which should be regularly examined for swelling or injury. 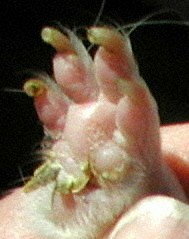 Guinea pig toenails grow constantly. Some grow straighter while others have a tendency to curl and lie to one side. 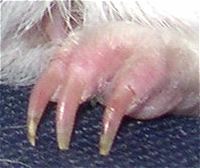 Short sharp pointy nails are characteristic of young guinea pigs. 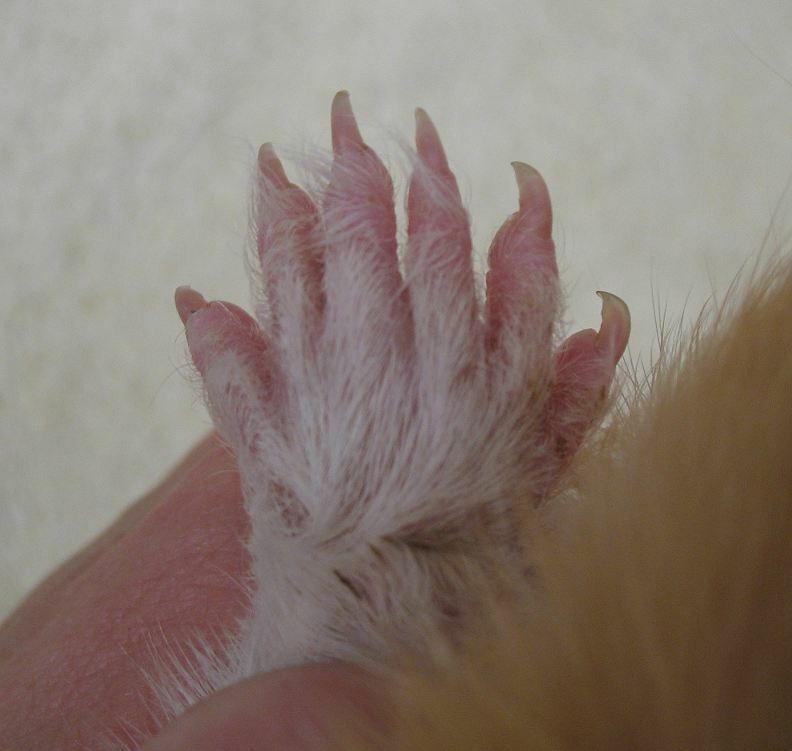 As a guinea pig ages, their nails tend to become thicker, more brittle, and grow more irregularly. Guinea pigs kept as pets generally require nail clipping, as their nails do not receive enough wear to keep them at the proper length. You may wonder about the age of your guinea pig. 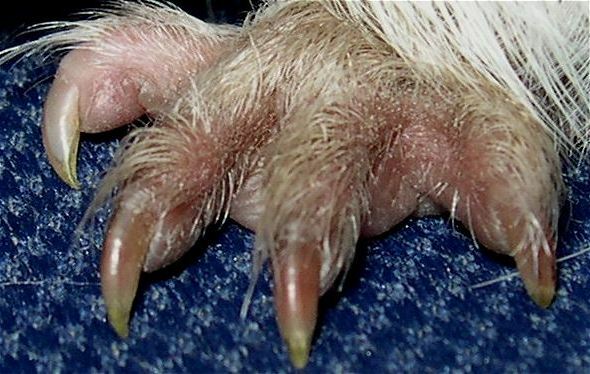 By looking at the nails, you can usually determine if your pig is especially young. Nails start out small and pointy. As a pig ages, they become thicker and require more frequent trimming. 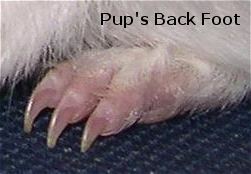 Begin a nail trimming routine while your pet is young by removing the very tip of their pointy nails. 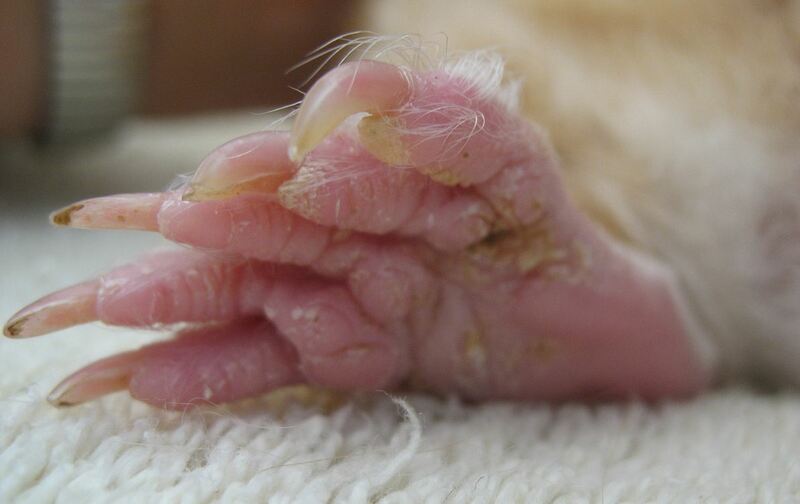 Find below photos of a 10 day old Hermeto's front and back feet. 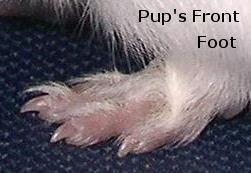 Paulo notes that since the nails were not trimmed, the quick has lenghtened accordingly, as described on the nail trimming page. 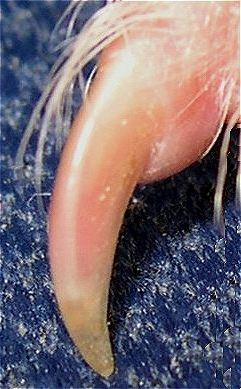 The photos demonstrate that some thickening and yellowing of the nail can occur even in relatively young guinea pigs. Click on the photo at left for a larger version of the pictured front foot. Click on the photo at the right for a close-up of a single back foot nail. Find below photos of 2 1/2 year old Gus's front feet (two colors). 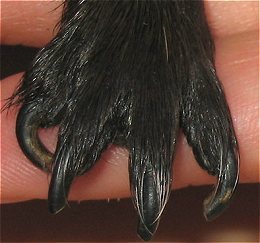 Check the Care Guide article on Nail Clipping for trimming tips. V.C.G. 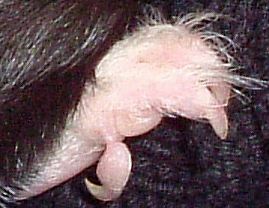 Richardson describes some guinea pigs as Polydactyly (having an extra toe or toes) usually on the hind legs and states that this may be the result of inbreeding. 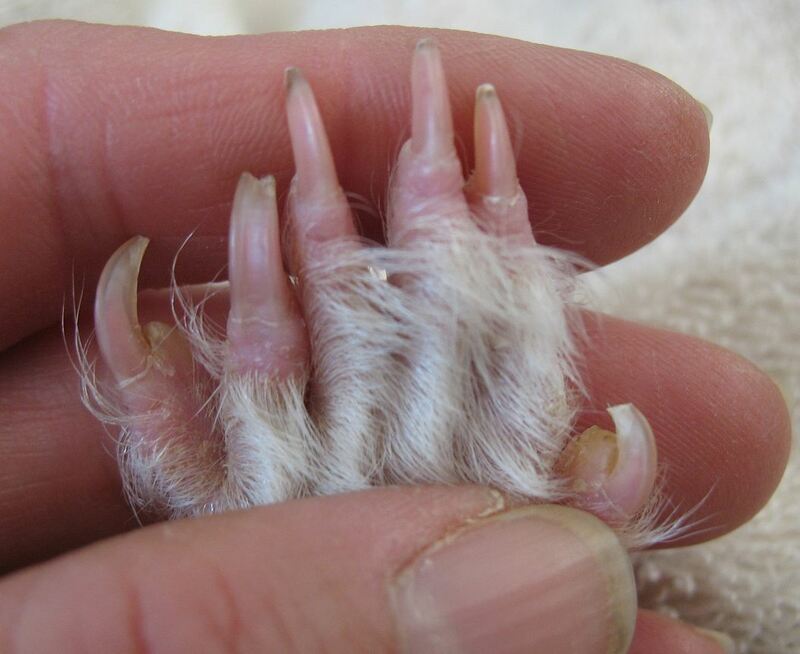 Removal of the vestigial or polydactyl digit by a veterinarian will prevent tearing. 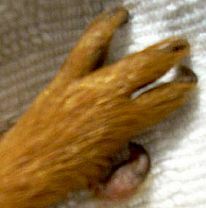 A veterinary evaluation is essential to the safe removal of the digit. A vet will evaluate the blood supply, bones, etc. to determine the best method. Removal by scalpel or surgical scissors under anesthesia can be safe and effective. In cases where the toe is hanging by a thread, a vet may use a ligature (tightly tied string to cut off blood flow to the dangling toe). See also: Hemingway, a pig with polydactyly (an adorable little pig with multiple toes on every foot). Breeding programs in South American countries have resulted in larger guinea pigs. When breeding goes wrong, genetic abnormalities occur. 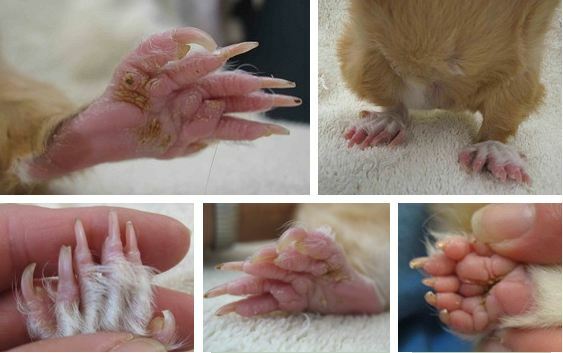 Some of these guinea pigs (also known as "cuy") have multiple toes. 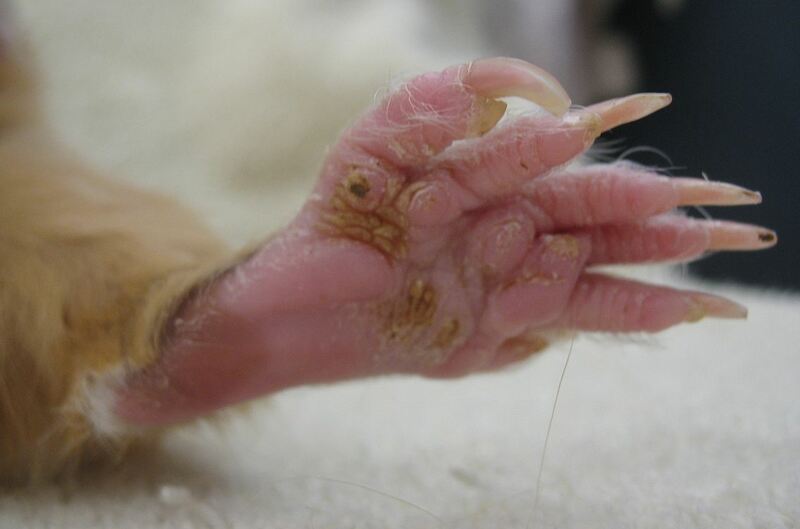 It is not known what other abnormalities accompany guinea pigs born with multiple digits. These guinea pigs should never be used for breeding. Photo at top left, thanks to Jonv9.6. Top right photo, thanks to jedifreac. Bottom photos, thanks to Djakarta. 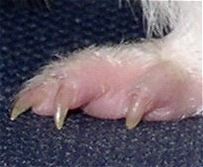 Occasionally a guinea pig's nail may catch and tear completely off. If bleeding is excessive, styptic powder may help. Usually the nail will grow back, although it may be more than a month before you see the new one. See a vet if there are any signs of infection like swelling or feeling hot to the touch. Some guinea pigs develop flaps of tough skin that protrude from their front feet. These spurs can be carefully removed with a nail clipper to prevent accidental tearing. Avoid clipping too closely and causing bleeding. Development of spurs does not seem to be related to the type of bedding or flooring used. The author notes only one of her three pigs grew spurs while the other two never had them. All guinea pigs were kept on towels and/or heavy cotton cloth. Now 6 years old, Snowflake (a photo of her foot appears at the right) no longer grows spurs. A combination of genetics, activity level and husbandry may all contribute to their development. V.C.G. 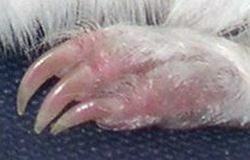 Richardson calls these flaps corns and describes them as horny material between the toes on the underside of the foot, most commonly found on the forefeet. She recommends cleaning a trimmed foot with a dilute solution of povidone-iodine. She warns that poorly kept living quarters (abrasive bedding materials and/or a dirty floor) may lead to infection and the development of pododermatitis.